Yesterday saw the second instalment of this years’ newly revised U12 Nationals; with such a large entry last year and numbers continuing to grow, the competition was split into a Qualifier round and an Elite competition with the quarter-finalists of the Qualifier being invited back to the Elite. 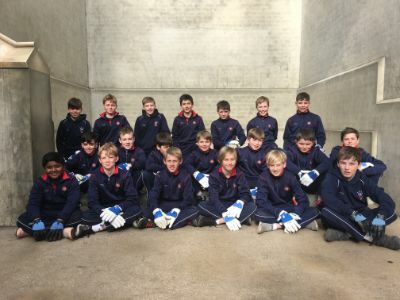 Berkhamsted was well represented with a total of ten pairs, the highest school entry, three of whom had come back having reached the quarter-finals or further of the Qualifier the week before. Thirty-five pairs in total took part with representation coming from Cranleigh Prep, Highgate, Ipswich, Ludgrove, St. Bartholomew’s St. Olaves, Summer Fields and Sunningdale. From the outset in the early group stages it was clear the standard of Fives was very high across the board, a huge leap on from what had taken place the previous week in the Qualifying tournament. It was particularly pleasing then to see that eight out of our ten pairs made it out of their group stages and all also then seven of these progressed to the 3rd round, an impressive statistic to the strength and depth the school can now put out. Our first pairing of Noah Head & Ben Spooner, last years U11 National Champions, had very little resistance all the way up until the semi-final stages. Second pairing of Charles Crocker & Oli Francis had a bit of a wobble against a solid looking Ludgrove 1 pair but managed to get through the encounter with a 2-0 win; it was in the quarter-finals though that their run ended against a determined Summer Fields 1 pairing. In their semi-final, Spooner & Head faced off against Summer Fields 2, the first game really where they met any form of resistance; saying this however they still manged a reasonably clean sweep winning in two comfortable sets. This then set them up in the final against Cranleigh 1, the same pair that had won the Qualifier tournament the week before. The set at first looked like it might be close with both pairs slowly chipping away at each other and pints coming very slowly; Head & Spooner just seemed to be very nervous for some reason. Once they had overcome the early nerves, they then began to play the level of Fives they are capable of running away with the set 12 – 5. A quick team talk between the 1st and 2nd set mainly revolved around their confidence and ability as opposed to altering their gameplay too much and it clearly was absorbed by both players; they came flying out of the stocks dominating the opposition in every aspect of play. They controlled all the rallies on top-step setting winners every time between the two of them, from the back of the court they kept all their shots tight and played winners when they presented themselves, but most impressive was their set piece play where they cut solidly throughout but in particular got back a good 90% of their cut returns allowing them to rack up the points quickly. 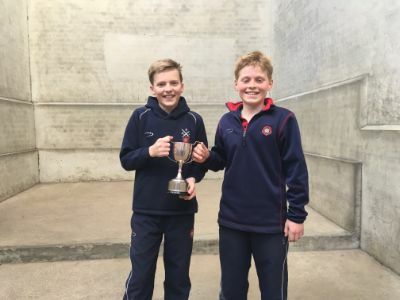 This allowed them to storm through the second set with a comfortable 12 – 3 and even more convincing was the fact the 3 pints they lost all came from their own unforced errors as opposed to winning shots from the Cranleigh pair. The third set ran in a similar vein with the boys never letting up and Cranleigh seemingly completely out of ideas as to how to get around them in any aspect of the game; this led to a convincing 12 – 2 win and two years in a row National Champions. Although the high level of Fives from all the players was wonderful to see, what was even more pleasing was seeing the boys’ attitude also off the court where they were always polite and courteous to both opposition players and members of staff. Well done and congratulations to all the Year 7 team.